AmeriGuard Pest Defense receives year-round calls for gopher service. Gophers are problematic in any landscape, but are especially frustrating when they begin to take over your nicely manicured lawn by pushing up mounds of unsightly dirt. Unfortunately, gophers do not hibernate. Periods of increased activity occur during mating season, which typically occurs in non-irrigated areas in late winter or early spring but can occur more often in irrigated residential landscapes. If a gopher has shown up in your yard, it’s time for a gopher service. AmeriGuard received a call recently from a distressed homeowner that had never experienced a gopher in her yard before. She didn’t know where to start and was worried about calling a company from the phone book and not knowing what to expect from a gopher service. She was reassured when Richard arrived in a marked vehicle and explained everything that he was going to do for the gopher service beginning with the gopher inspection. Richard walked the front yard of the property to visualize any changes in the landscape. The most obvious change in the landscape was the dirt that had been pushed up from below ground as well as some soft areas present below the grass that might indicate the presence of gopher tunnel systems below. A gopher probe was then used to further investigate any underground gopher tunnel systems. The probe is a useful tool because it will give way and drop about 2″ once the gopher runway system is located on either side of the gopher activity. 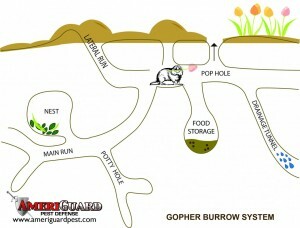 For this gopher service, a pellet grain bait was applied in the underground gopher burrow systems. 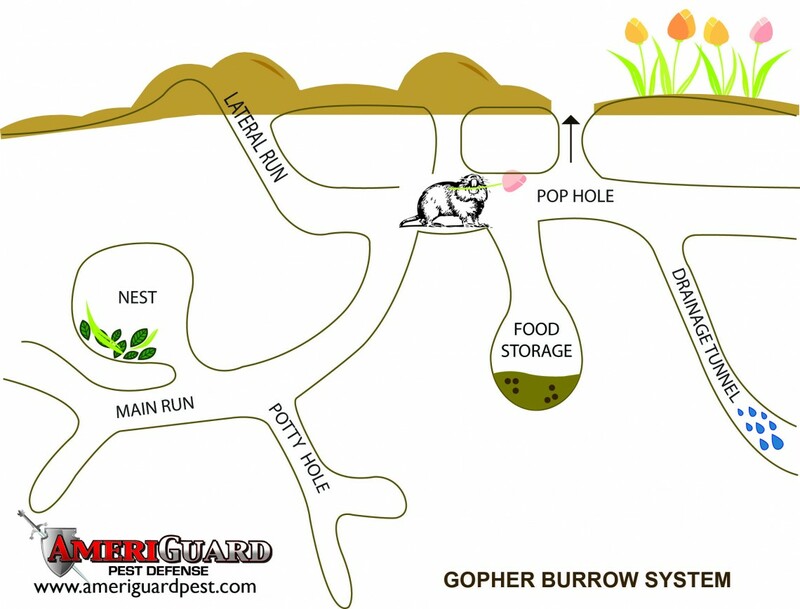 AmeriGuard Pest Defense offers a One-Time Gopher Service for isolated gopher infestations with low-retreat prices. For severe gopher problems, we offer packages for repeat services within specified time frames. Monthly gopher services are also available for residential and commercial accounts where gophers are geographically problematic and opportunity for re-infestation is likely. 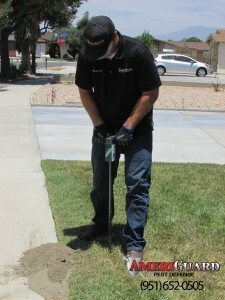 Free gopher estimates are available for calling our office at (951) 652-0505. We look forward to speaking with you about all of your gopher control needs. The sooner you treat a gopher infestation, the sooner gophers won’t continue to ruin your beautiful landscape. 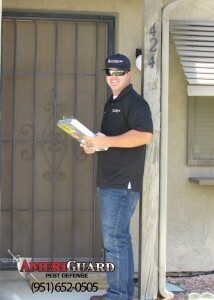 Find out what our satisfied customers are saying about AmeriGuard on Yelp.